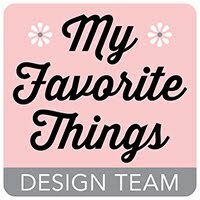 Hi there and welcome to the My Favorite Things New Product Tour! 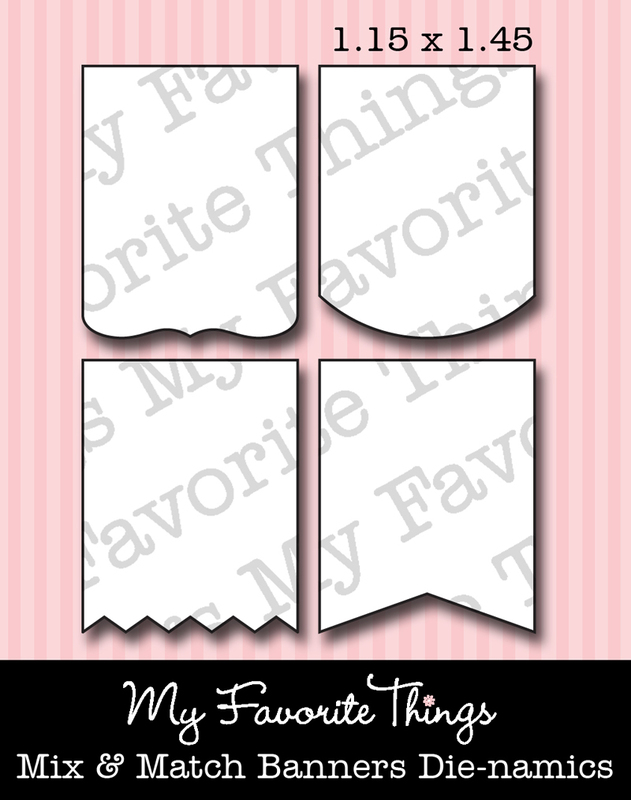 Everything you've seen teased over the last week is now available for purchase in the MFT Boutique! Head on over to the MFT Blog for a complete list of designers. You'll want to stop by each designer's blog and leave a comment because there is 50.00 prize up for grabs for one lucky participant! 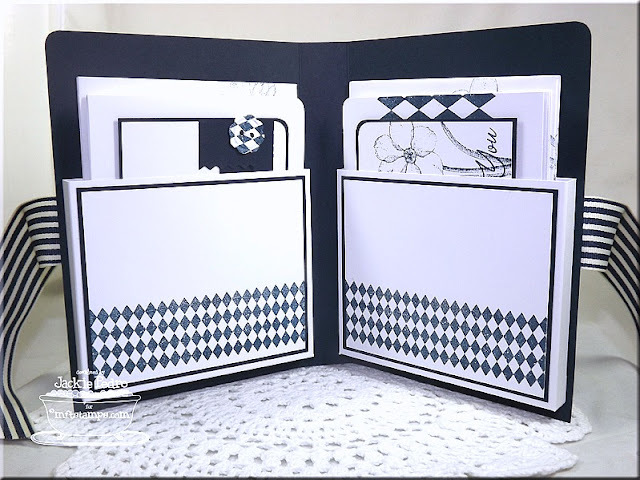 I've got a card set with a case too share with you that I made with the new Distressed Diamonds and Harlequin Die-namics. 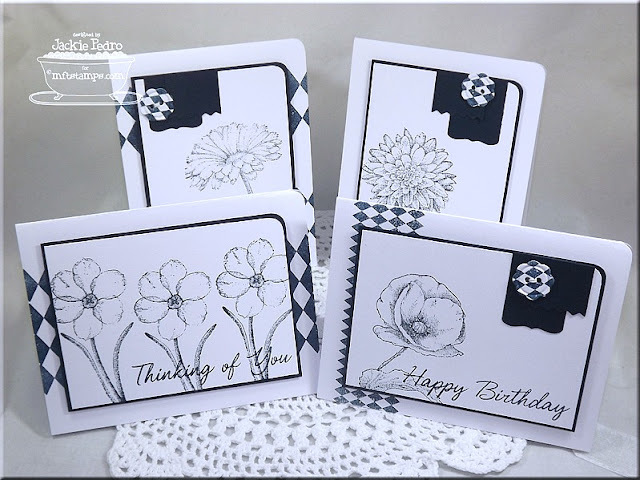 I've also used Inspired by Flowers 3 and Inspired by Flowers 4, Finishing Flourishes (for the sentiments) and the following Die-namics: Button Quartet and Mix and Match Banners. You can find the tutorial for this set on my friend, Amy Kolling's blog. I pinned it several months ago and this was the opportunity to get it done! Thanks, Amy! This post is picture heavy, so grab a cup and relax! Here is the set all boxed up and ready to go! 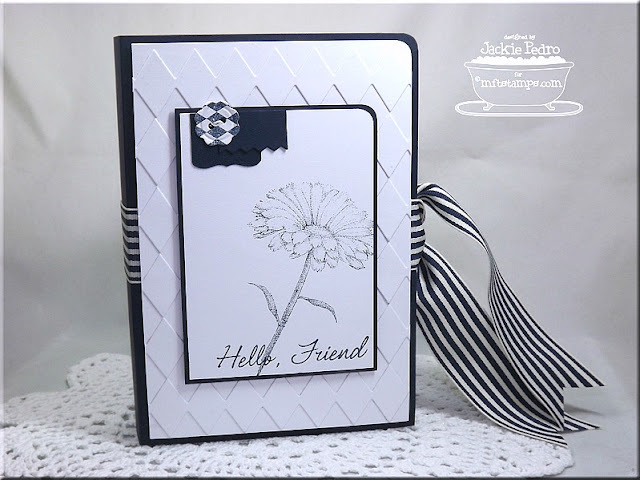 I used the Harlequin Die-namics to make a white on white diamond pattern. LOVE the look. I stamped the Button Quartet button with Distressed Diamonds using Midnight Muse Ink. 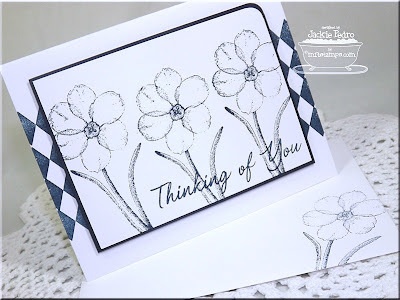 The flower from Inspired by Flowers 4 and was stamped in Midnight Muse ink along with the sentiment from Finishing Flourishes. A rounded corner and some beautiful striped ribbon complete the outside. Here is the set of cards. I used Night of Navy cardstock (SU) and it IS Navy, although it looks black in these pics. Well, if you're still here, THANK YOU!! Now go forth and shop!!! I'm just going with WOW! Oh this is a wonderful project! Love your work! Delicious!!!!! what a beautiful card gift set ! ...love the classic color combo! what an absolutely gorgeous set of cards!!! love the navy and white combo... so clean and crisp! Such elegant work. Love the color palette. Wow! Beautiful! What a great set! 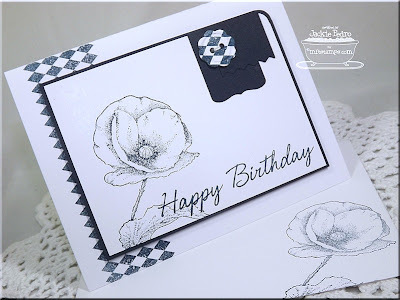 Love the flower stamps. Actually I love the whole thing, but the flowers really stand out. They are so striking on the white! This is SUCH a beautiful set! The flowers are gorgeous and you made every card awesome. Really beautiful set of cards! I love the black and white. This really a beautiful set! So elegant and I love the black and white. WOW Jackie! What a stunning collection of cards! So elegant! Thanks for the inspiration! 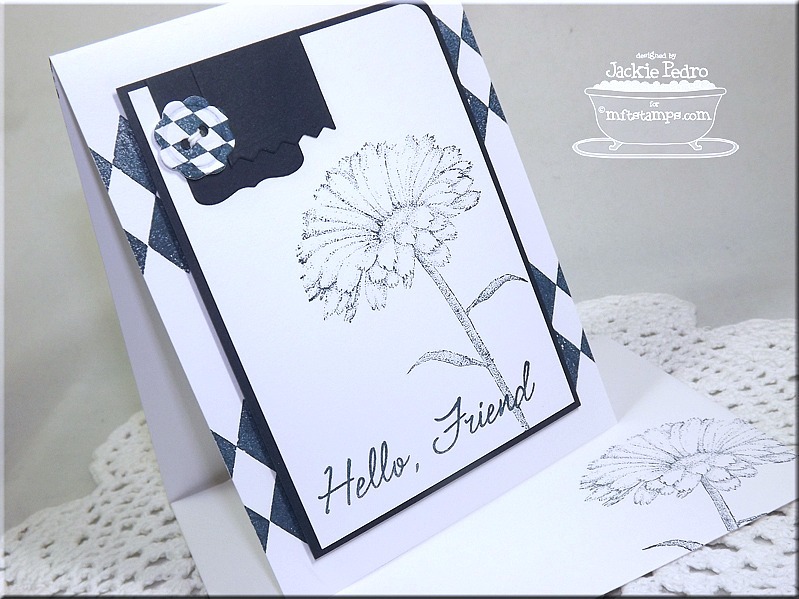 The harlequin die is already in my chopping cart! You have made an amazing set Jackie....classy and beautiful! !! !GORGEOUS GORGEOUS GORGEOUS!!! This is going to be my Christmas gift to a couple of people! After I "go forth & shop"!! Gorgeous set! I love how you used the dies and stamps. Love the navy and white look. Wow just awesome! So many great dies! wow! these are stunning! the white and navy with the distressed diamonds-WOW! love it Jackie! What an elegant set! It would make the perfect Christmas gift!! SHUT UP YOU!!! This is brilliant my friend! And I LOVE the black and white (or is it grey??) either way, ROCKS!!!! Jackie - this is a stunning set of gorgeous cards! Jackie, this is stunningly beautiful!!! What a Fabulous gift for someone! This is amazing. What a great gift. just beautiful! what a gorgeous gift! This is elegant!! 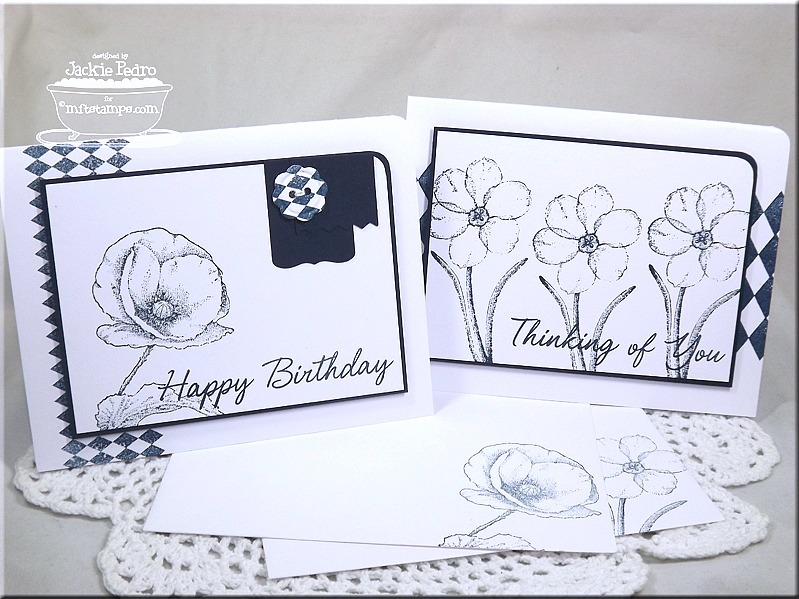 Great way to give someone cards to use later as a gift. Wow!!! 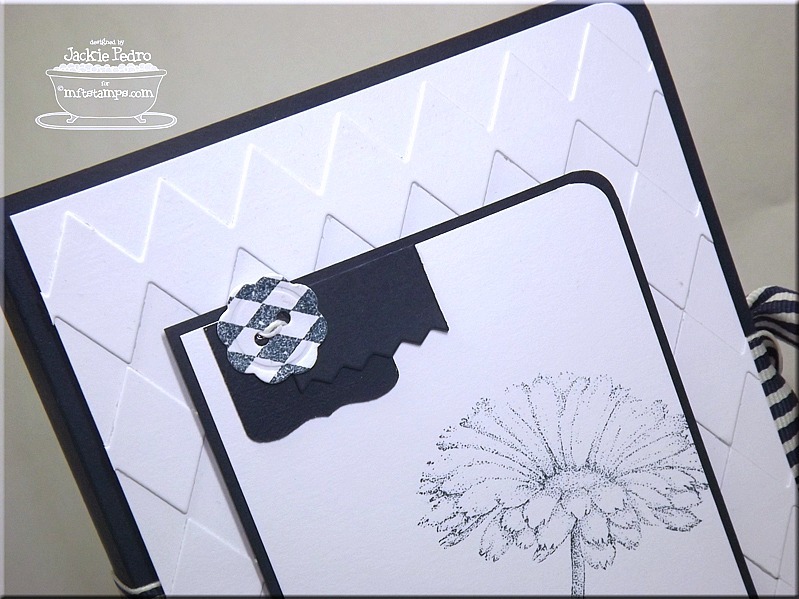 Beautiful cards and holder, stylish and striking. What a great gift. Love the graphic black and white Jacks! This is a beautiful set! 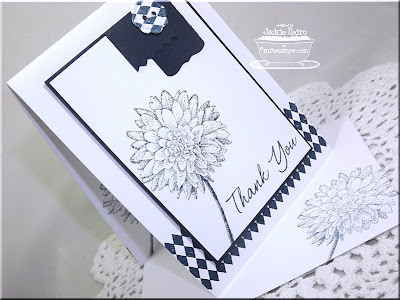 Love B & W cards and this project is fabulous!! Beautiful elegant set of cards and I love the little holder too. Great work! Wow!!! this is stunning!!! Thanks for sharing the instructions. I have pinned it too!!! What a wonderful gift idea!!! Your cards are incredible! CAS at it's most beautiful!!! I love the look of the same color die cut on the base CS. 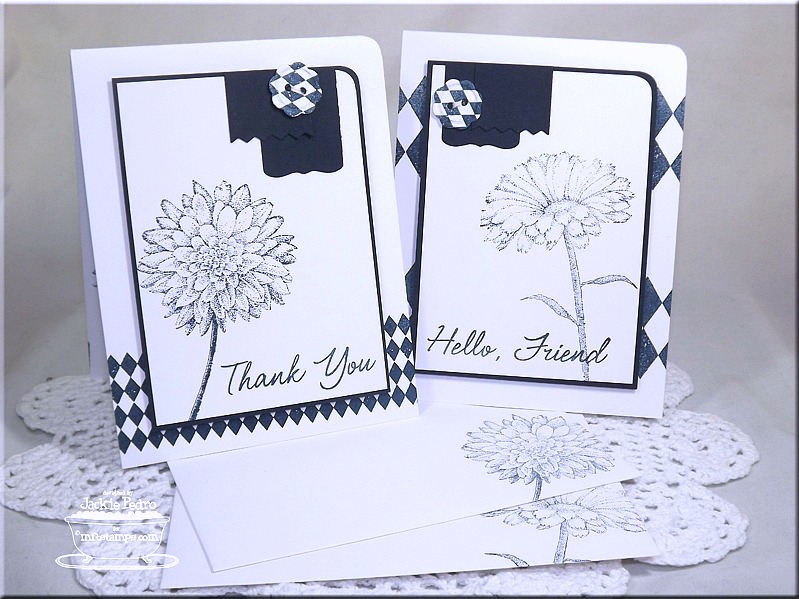 I saw a card that way in a magazine and I was thinking last night how pretty some of MFT's Dies would look this way! LOVE it! At first when I saw the picture I thought it was a covered journal...then, WOW!!! How beautiful is this! Love, love, love this set...just beautiful! So incredibly elegant and beautiful! GORGEOUS!!! Jackie, I love your card set, thanks for the inspiration! Oh wow! 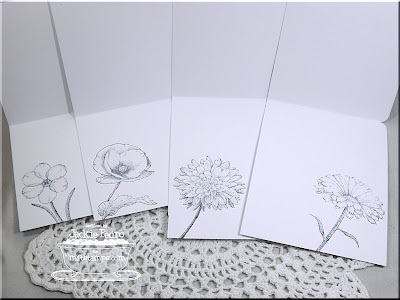 who wouldn't just love to receive such a beautiful note card set, great Job!! love the faux buttons! Oh my! You have outdone yourself, Jackie. This is spectacular. What a treasured gift this would make. oh my gosh. this is so striking! 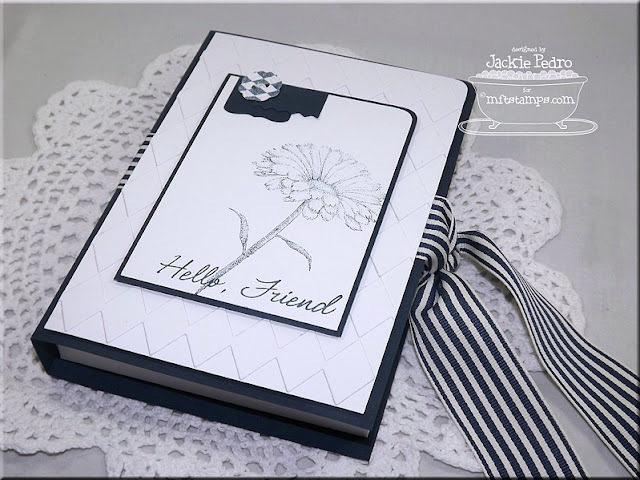 Love the black & white and what a beautiful project/gift!!! Oh, Jackie! This is breathtaking! WOW I SO adore this crisp, clean and elegant gift set!!! SO much work and gorgeous details...love the tone on tone Harlequin Die-namics!!! So beautiful...I'm speechless! Stunning gift set! Absolutely stunning! 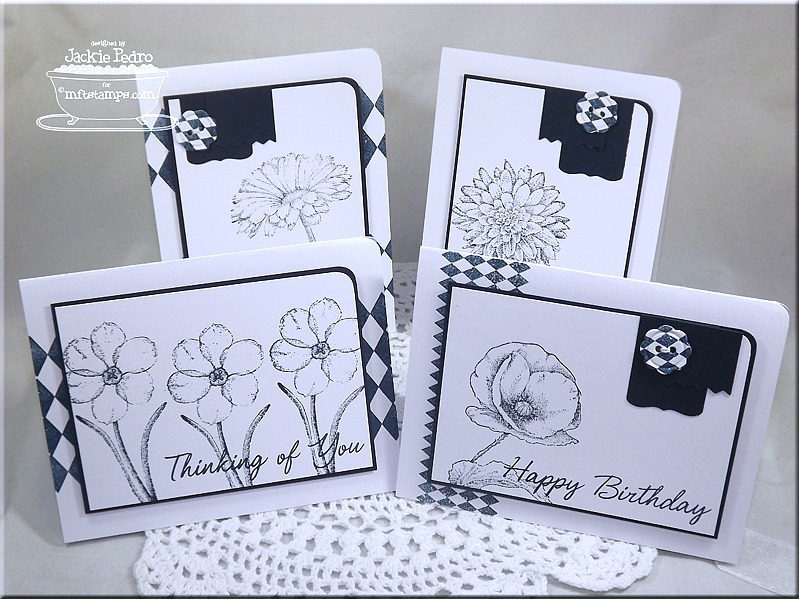 Wowzer's love these adorable cards, what a fabulous set. I am so going to have to kopykat that little banner/button idea! Love it. Wow! What a truly stunning set - a fabulous gift!! Nice contrast between the Harlequin and Florals! Beautiful gift set! Love the simplicity of just two colors. Beautiful set. The cards and the box are wonderful. I bought the diamond die, can't wait to get it. Wow, these are all gorgeous. Love the black and white theme. Thanks for sharing. Love this black&white set! Great! Love the beauty and simplicity of the black and white. oh this is beautiful Jackie! Off to look at the tutorial! MFTeasers Day 4 Lollipop Treats!